With my lofty plans for triumphs in the kitchen this week, I thought I might start off with something that I knew would be easily stored, quickly reheated, safely transported to my little sister so she could simplify her college life and (hopefully) be focused on homework and not have to worry about a few dinners. I will be counting this as 4 meals, because we ate it twice (some leftovers, but mostly the night I made it) and there’s enough filling and pie crust to send two home with my little sister, and have one to defrost later for us. It’s also always so much easier to start your challenge with something that you know wil be an easy success, it’ll keep the motivation there for the next experiment or meal. Plus, we had what I thought would be one of the coldest nights left (I was wrong…) so it seemed appropriate that we would have some comfort food. One of the things that I am frequently guilty of, cheaping it out – and I mean, subbing in things that are in the same “family”, but not exactly the same because it seems wasteful to buy an ingredient that is more expensive and that I’ll only be using for this one meal. Heavy cream is rarely something that I’m willing to buy, I know that it’s only about $2, but I rarely buy milk so when I am making a recipe like this, I’d rather buy the more versatile half gallon of milk than the smaller, heavy cream. 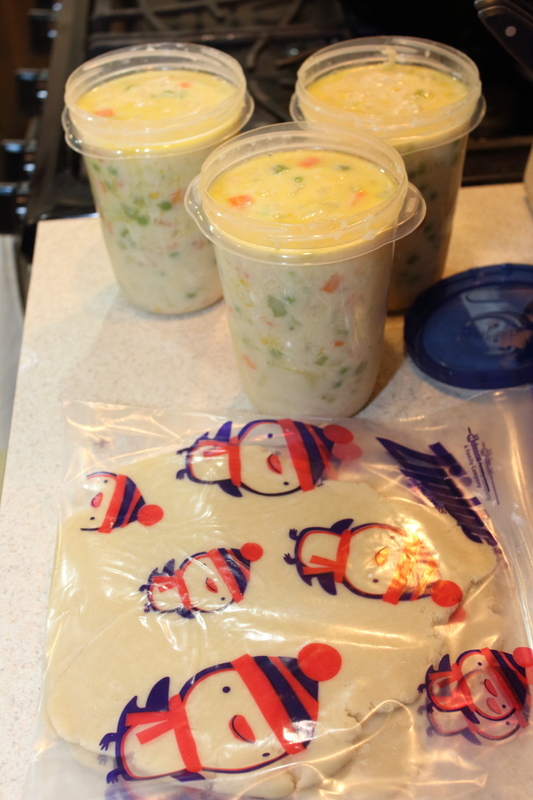 This means that my chicken pot pie isn’t always as creamy and thick the first time you cook it – but it will thicken up for reheating, and the taste is still there. In a dutch oven, or large pasta pot melt the butter (sometimes I add a tablespoon or so if I’m using milk instead of heavy cream to keep fat content up, but most of the time I forget and just use the called for amount…) add onions, carrots, celery, peas and corn – cook on a medium-low flame until the onions become translucent. Add chicken and potatoes, mix until combined – sprinkle with flour and mix gently to coat all the ingredients in flour. This thickens the broth base, so make sure it’s not all clumpy and weird. Add broth, bullion and wine – mix until combined and sort of soupy. Cook for about 5-7 minutes stirring frequently. Add cream/milk, and turn to low heat and continue stirring until the broth thickens up – another 5-7 minutes, roughly. Remove from heat, and season well – make sure to taste so that it doesn’t end up being under-seasoned. In a large bowl, mix flour and salt. 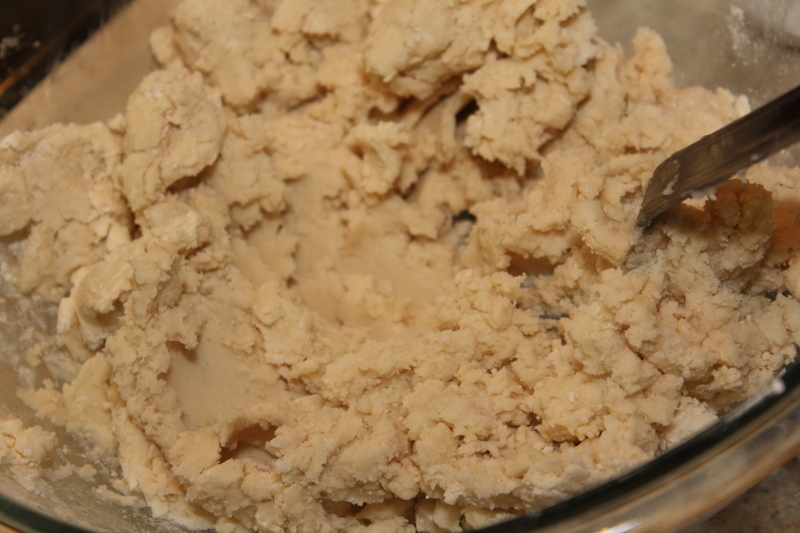 Add shortening, and cut in with large for, pastry cuter, or hell, even a potato masher (sometimes things get desperate around here, I’ll try whatever is handy…) until the mixture is combined, but gets a little clumpy. In a small prep bowl, lightly beat the eggs, check for shells, and then add to flour with water and vinegar. Mix until just combined. Separate into loose balls for the amount of crusts you are preparing. 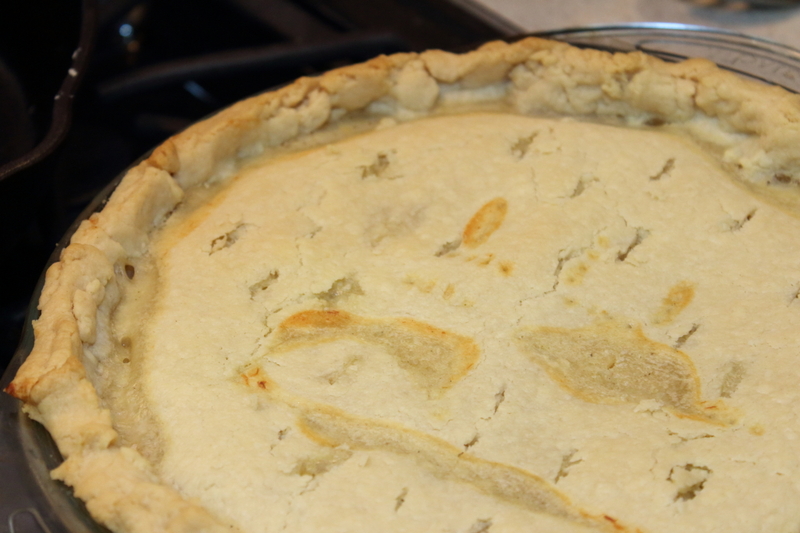 I will usually go for 5 crusts with this recipe, that way they are nice and thick for pot pie, which I always like to have a somewhat hefty crust on. To freeze: put balls of dough in ziploc bags, roll out a little so they fill most of the end of the gallon bag, then seal up bag for easy freezing/defrosting/rolling when ready to use. 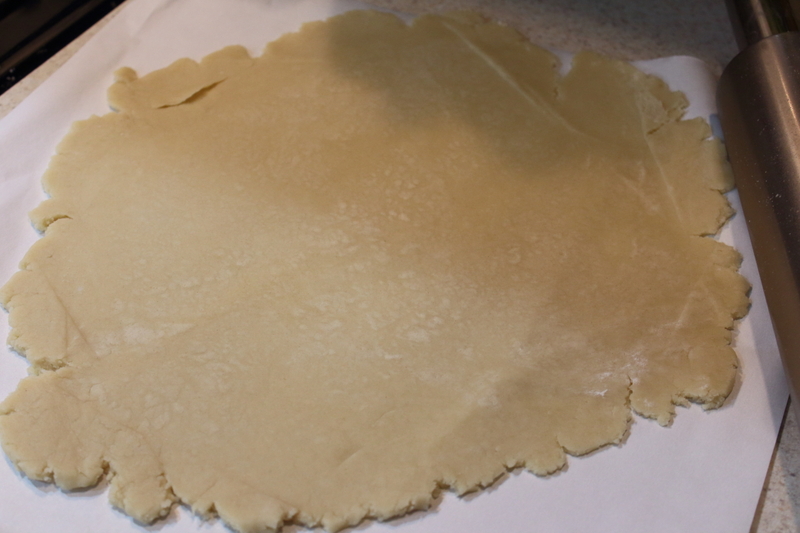 Roll one out large enough to cover a 9″ pie pan completely, set aside on parchment paper. Cover your pie completely. Poke LOTS of holes in the top so that heat can escape while cooking, and things don’t get crazy messy in your oven. I usually put a baking sheet until the pot pie just in case things overflow, because there is nothing less exciting than cleaning an oven… But if you don’t over fill the pie dish, then you should be good. Bake pies at 400F for about 30 minutes or until golden brown on top. Let them cool a little so it’s not hard to serve, we like to top ours with hot sauce and a bit more fresh ground black pepper. If you are defrosting filling and pie, I suggest putting it in the fridge the day before you want to use it, making sure to put them on a big dish or something to catch all the condensation (something I am often faulted for forgetting…) and then when the filling is fully defrosted in fridge, you can leave the crust chilled a bit until ready to use. 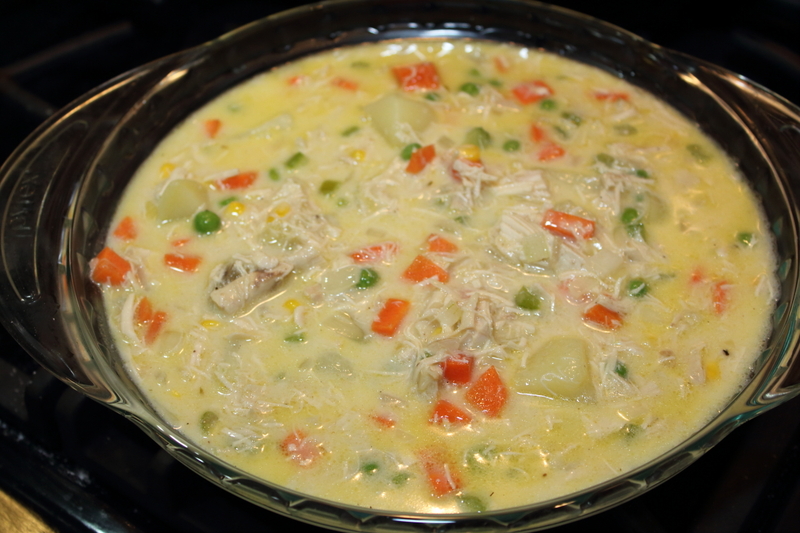 Love chicken pot pie, yours looks great, there is hardly anything more comforting than a pot pie, Delicious! Comforting times two since it can be defrosted easily for another meal. 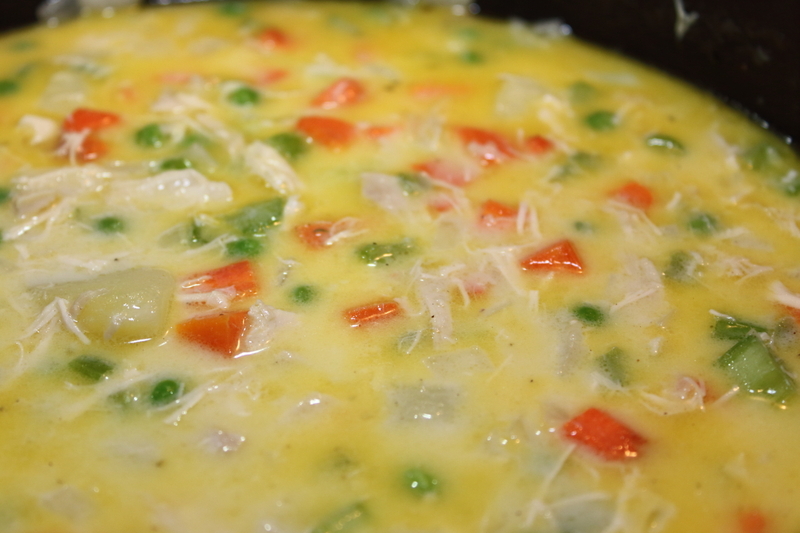 It’s one of my favorites for cold dreary days and definitely a favorite make-ahead meal!